French fireplace mantels are ideal for Southern California coastal living. Their simple elegance and fine details set off almost any home or business décor, from a casual home with furniture featuring natural fibers to a more elegant and luxurious hotel lobby. 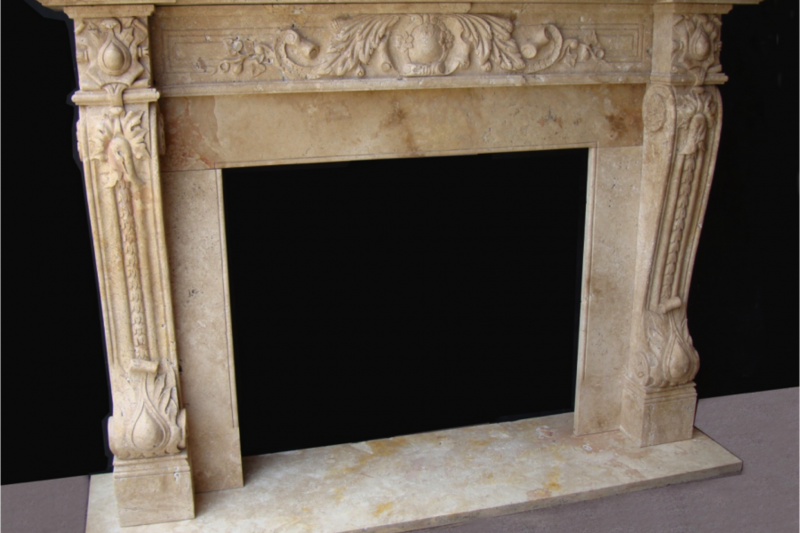 SoCal Fireplace Mantels strives to be your premiere provider for French fireplace mantels in Los Angeles. What sets French fireplace mantels apart from other types of designs is the clean look of the mantels. Although French designs can, and often do, have a multitude of fine details, such as swooping curves, floral patterns, and other geometric shapes, the mantels never approach the level of detail that would qualify for the term ornate. The designs create a flowing, pure look that is typically accentuated by light colored materials. SoCal Fireplace Mantels, your Los Angeles French fireplace mantels provider, provides a number of French designs that are ideal for your home or business. SoCal Fireplace Mantels is your leading provider for French fireplace mantels in Los Angeles because of their vast selection of materials. Most French fireplace mantel designs are best suited for materials that are light in color. We offer white marble, which is one of the traditional choices for French fireplace mantels, as well as yellow marble, green marble, travertine, and cast stone. Choose the material that best matches the design and the color scheme of your home or business. SoCal Fireplace Mantels invites you to stop by our showroom in Van Nuys and find out why we are the leading Los Angeles French fireplace mantels provider. Our knowledgeable sales representatives will be glad to walk you through our 4,000 square foot showroom and help you choose the French fireplace mantel that is perfect for your needs. If you do not see a design that strikes your fancy, we also work with customers to create custom designs. Visit our showroom or call today to request a catalogue so you can browse our many options for French fireplace mantels, overmantels, natural and cast stone statues, benches, and other architectural products from the comfort of your own home. Should you have questions, feel free to call. Our skilled sales staff is glad to be of assistance, and provides services in Los Angeles, Orange County and Ventura County.